A teenager slashed with a knife while riding his motorbike claims a youth attacked him simply because he drove by on a motorbike. 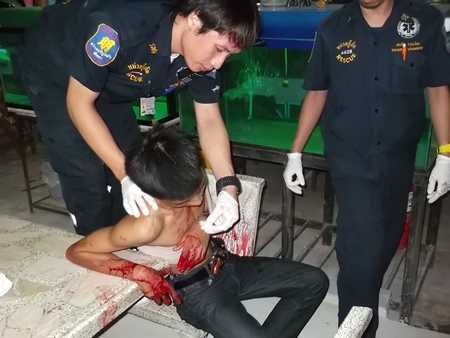 The 16-year-old ran into a congee shop on Third Road following the late-night May 14 incident to escape his attackers. He sustained a deep wound to the back and was treated at Banglamung Hospital. The boy told police he and a friend were driving their motorbike down Third Road when they passed a group of youths who looked angrily at them. The victim said he turned around to drive home, but the gang pursued and slashed him in the back. The teen provided a description police are using to track down the assailants. This 16-year-old received a knife wound, he says, because he looked at a teen biker gang.